Nanofluids, fluids containing nanometer-sized particles, show immense potential for future engineering. 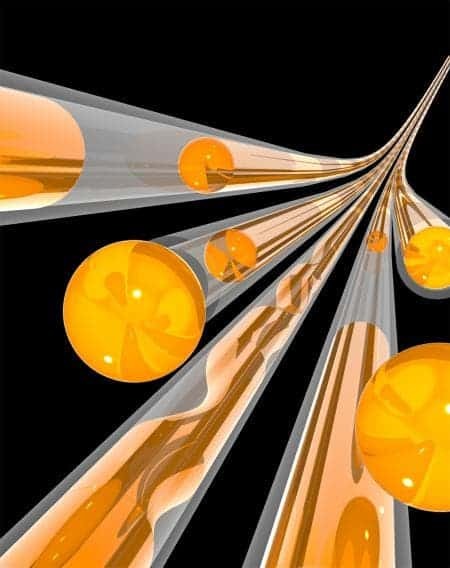 Even water flowing through nanotubes flows much faster than traditional mechanics says it should be possible. Now, researchers have found a way to directly image nanofluids. Researchers at Caltech have applied a new imaging technique called four-dimensional (4D) electron microscopy to the nanofluid dynamics problem. The technique was invented at Caltech, and basically involves a stream of ultra-fast-moving electrons bombarding a sample in a carefully timed manner. Each electron scatters off a sample, providing a still image that lasts about a millionth of a billionth of a second. They are able to make millions and millions of these scatters, and stitch together the images – creating the result you see below. Ahmed Zewail, the Linus Pauling Professor of Chemistry and professor of physics, and Ulrich Lorenz, a postdoctoral scholar in chemistry, the authors of the paper, used single laser pulses to melt the lead cores of individual zinc oxide nanotubes. Then, they observed how the hot pressurized liquid moved within the tubes. “These observations are particularly significant because visualizing the behavior of fluids at the nanoscale is essential to our understanding of how materials and biological channels effectively transport liquids,” says Zewail. In 1999, Zewail won the Nobel Prize for his development of femtosecond chemistry. Scientific Reference: Lorenz, Ulrich J. and Zewail, Ahmed H. (2014) Observing liquid flow in nanotubes by 4D electron microscopy. Science, 344 (6191). pp. 1496-1500. ISSN 0036-8075.